Buy Cheapest Instagram Comments from Real Users! Yes! Comments are real. Unlike many sellers out there, who use bots, we want to add real value to your Instagram account. Our comments will be tailored to your post’s needs. The comments you receive will improve the engagement on your posts. We deliver only real comments from real users. No! That never happens. Once you receive a comment, you’ll have it on your post for permanent. No matter how much more interaction you get on your post, the comments you buy will always remain. If the comments ever drop, kindly contact and we will give you free replenishments. Yes! When you buy real Instagram comments from us, you get them from real users. We comply with all necessary policies. And we always employ approved strategies. You can expect a positive experience when working with us. With our comments, we seek to provide value and help establish your account as valuable. At SocialGrand, we use SSL protection. And we adhere to established data protection regulations and privacy rules. You will never be asked for your account password. The information we need from you such as email and usernames will never be shared or sold. They are encrypted and stored securely. We value and prioritize your privacy. How fast will I start receiving the comments? You can expect your comments in two hours time. We know time is of the essence in social media sharing. And your post needs to have engagement quickly. We, therefore, deliver real comments to your posts in a couple of hours after your purchase. If you notice that there are no comments after 24 hours, please contact us. You can pay via PayPal or coinpayments.net. You can use your credit card with PayPal. Or you can use crypto coins on coinpayments.net. Payment is quick and easy. And as soon as we receive payment, our team gets to work as soon as possible. Contact us if you experience any difficulties with your payment. Ever wondered why some Instagram posts keep showing up on your feed? Chances are these posts have many comments which indicate high interaction. Instagram algorithms pick them up again and again. They even get priority over more recent posts. And here’s a crazy fact: users missed 70% of the posts on their feeds. This is because users follow more and more people, and the number of posts in their feed will increase. Getting comments for your Instagram posts will give them a longer visibility period and improve their rank. This means your posts will keep popping up on people's feeds. And that increases the change of being seen. 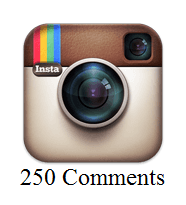 So, for more success in marketing your brand or business on Instagram, buy Instagram comments for your posts today. You've probably checked out the explore tab of your Instagram profile. Guess what? Most people do that. It's a great way to find popular posts and check out what's trending. This segment provides a great opportunity to be discovered by new users and increase your followers. But how do you get there? You increase engagement on your posts. You can buy cheap Instagram comments to start you off, especially if your profile is not yet popular. And as more people see your posts, expect a spike in your number of followers. Even better: these new followers will further increase your reach. Did you know that the comment section of many social media posts is a goldmine? In a world where reviews and feedback have a great effect on sales and popularity, comments are invaluable. And to reap the benefits of this, ensure you reply to most of the comments on your post. This will build trust with your followers. They will see that you care enough to reply. And they are likely to comment on your future posts because of that. As the engagement increases, you are sure to get valuable feedback. You can simply ask a question and they will answer and give you honest feedback because of the trust that has been established. Picture this: you upload a great post. You get lots of comments. You are getting real feedback from your followers. Feedbacks that the biggest brands are after. I bet you can guess what's likely to happen next. Lots of accounts will start reaching out to you… hoping you can give them a mention or a tag. Or recommend their product. Why? Because they want to market their products. Influencer marketing is big on Instagram as brands seek to put their products and services in front of more people. And the more comments a post gets the better. So, if you'd love to get connections to some big names, increase your Instagram comments by buying them is the fastest way. Nothing says “popular Instagram profile” like high levels of engagement on your posts. A profile with lots of comments is a sure sign that your brand or business has a good following. It also shows that people find your content helpful and relevant. On the other hand, a profile with little engagement will cast you in a bad light. You won’t get feedback on your content and your marketing will not be effective. Remember: everyone wants to be associated with the popular guys. You can buy comments on Instagram and boost the popularity of your posts. A lot more people will check it out if only to find out what other users are saying about it. And as engagement increases, the value of your profile will increase. Instagram Comments Overall rating: 4.7 out of 5 based on 39 reviews.